Just when you thought your toilet could do it all—have a built in seat warmer, play music, set mood lighting, and more—it just got more advanced. Now, specialized toilet seats will be able to help patients with congestive heart failure. 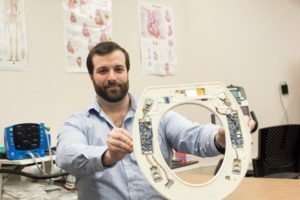 A team of researchers from Rochester Institute of Technology has created a toilet-seat based cardiovascular system that monitors and tracks certain vital bodily functions, such as heart rate, blood oxygenation levels, blood pressure, and a patient’s weight and stroke volume. These toilet seats—still going through the FDA approval process—will help to lower hospital readmission rates for patients with this condition. Specialized algorithms with analyze data collected from the toilet seat and, if necessary, send alerts of deteriorating conditions. Reports will also be produced to share with cardiologists to determine if other intervention is necessary. The brainchild of Heart Health Intelligence, this toilet seat can help save hundreds of thousands of dollars on hospital readmission bills, as well as countless lives. Founder and CEO Nicholas Conn says, “Typically, within 30 days of hospital discharge, 25 percent of patients…are readmitted. After 90 days of hospital discharge, 45 percent of patients are readmitted.” On top of that, hospitals are getting penalized by the Centers for Medicare and Medicaid Services for these readmissions due to heart failure. 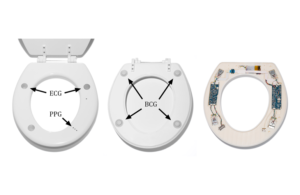 One of the extraordinary technological features of these ‘smart’ toilet seats is that they will actually be able to notice deteriorating conditions before a patient can, and as a result, can potentially turn a hospital readmission into a simple drug change or short office visit with a doctor. While these seats aren’t quite ready for commercialization yet, when they do hit the market, they could save hospitals a predicted $300,000. The national average for readmission patients is around 150 patients, which costs $500,000 annually. The cost of these advanced monitoring toilet seats would be approximately $200,000, leading to savings of more than double hospitals’ initial investments within just one year. Hopefully these toilet seats will be pushed through the pipeline soon. The HHI team is already heavily underway with clinical trials and securing additional grants. When these do become common use in hospitals, they will have the potential to save countless lives and hundreds of thousands of dollars that can be put back into the healthcare system to assist more patients.